Andy Warhol’s 1962 painting Gold Marilyn Monroe (in the collection of the Museum of Modern Art in New York) is one of the most famous examples of contemporary art. Much of the attention paid to this work has focused on Warhol’s use of a publicity image of the recently deceased movie star Marilyn Monroe. Critics and advocates of Warhol’s art have attempted to unpack what Marilyn might have meant to him. Was his work a celebration of her and the celebrity culture that she represented? Did Warhol mean to critique the way that mass consumer culture could rob the individual of their identity? Even discussions of Warhol’s art in the context of his now widely recognized Byzantine Catholic faith have wondered if Marilyn Monroe might be read as a modern interpretation of the Virgin Mary. I would like to consider an aspect of this painting, which often gets mentioned only in passing, Warhol’s use of the color gold. In fact, this hand-painted field of gold (paint, not actual gold leaf) comprises a majority of the painting. Gold is a very particular and unique color. Not only does gold have numerous associations, from glamour and wealth to spiritual devotion and immortality, but it optically operates differently than other colors. In Warhol’s Gold Marilyn Monroe the gold field is, simultaneously, a perfectly flat surface and an infinite space. 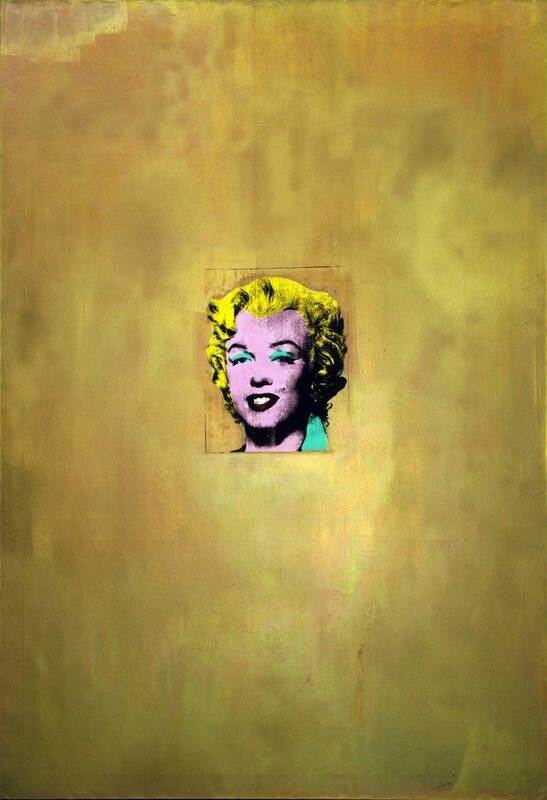 Warhol’s use of gold engages and unites two paradigms of image making. The first of these is purely material. This point of view is supported by Warhol’s own often quoted statement, “If you want to know all about Andy Warhol, just look at the surface: of my paintings and films and me, and there I am. There’s nothing behind it.” This orientation, which was shared by some of Warhol’s contemporaries, such as Donald Judd and Frank Stella, focused the viewer’s attention on material characteristics of the art object. In this paradigm, the work of art has no pictorial illusion of or symbolic reference to anything beyond itself; it is imminently present in the time and place of the viewer’s encounter with it. The second paradigm is a method of art making that develops out of the theological association of gold to pure light. This point of view is supported by Warhol’s private Byzantine Catholic faith. The Byzantine Catholic tradition is Catholic in the sense that it recognizes the authority of Papacy in Rome, but it is Byzantine in its liturgical use of icons and iconostases. Scholars of the icon, such as Pavel Florensky, have discussed the theological relationship between the use of gold in icons and transfiguration of Christ, which according to tradition occurred on Mount Tabor. In the icon gold is a revelation of uncreated and transfiguring light. It is metaphysical splendor made visible. Applying this visual theology of gold as sacred light to Warhol’s Gold Marilyn Monroe, the work of art becomes a means by which the beauty of the present is revealed, just as the beauty of Christ was revealed on Mount Tabor. In The Pillar and Ground of the Truth, Florensky wrote, “[the light of Tabor] that is full of grace... is beautiful in itself, and it makes all that is visible beautiful.” Florensky went further to state, “There is no object so repulsive that intense light would not make beautiful.” One reading of Gold Marilyn Monroe, and Warhol’s larger project, is to consider his art as a reclamation and even redemption of what has been discarded. The world of masks is a manifestation of a spiritual divide between heaven and earth. Warhol’s use of gold within the Byzantine Catholic tradition addresses this boundary between the visible and invisible worlds. Returning to the fact that gold can read as both flat and infinite, Gold Marilyn Monroe is simultaneously material and immaterial. As a material object it exists in the same time and space (at the MoMA) as the viewer. However, like every great work of art, it has a spiritual presence that the material cannot contain. Through his use of gold, Andy Warhol created a point where the veil becomes more transparent as heaven and earth draw closer together. Andy Warhol: Gold Marilyn Monroe, 1962, silkscreen ink, 2,11 m x 1,45 m. Museum of Modern Art (MOMA), New York. Andy Warhol was an American painter, filmmaker and author, and a leading figure in the Pop Art movement. Andrew Warhola was born in Pittsburgh, Pennsylvania. His parents had emigrated to the USA from Ruthenia, a region now in the Slovak Republic. In 1949 he moved to New York and changed his name to Warhol. He worked as a commercial artist for magazines and also designed advertising and window displays. In the early 1960s, he began to experiment with reproductions based on advertisements, newspaper headlines and other mass-produced images from American popular culture such as Campbell's soup tins and Coca Cola bottles. In 1962 he began his series portraits of Marilyn Monroe. In 1963, Warhol began to make experimental films. His studio, known as the Factory, became a meeting point for young artists, actors, musicians and hangers-on. Warhol was now established as an internationally famous artist and throughout the 1970s and 1980s exhibited his work around the world. On 22 February 1987, Warhol died unexpectedly in a New York hospital following a gall bladder operation.